Strongest substance in the world? What do you guys think is the strongest substance in the world? Diamonds? Granite? Graphene? Metallic glass? Well, if you said any of the above, you are dead WRONG. This baby contains an ancient metal called Runite that renders the crew more or less impervious to the effects of small-arms fire and high caliber weapons. Bk realism mod displays the awe inspiring ability of the 37mm anti tank pak to resist enemy fire to such a realistic degree that I have to thank Markr for being so thoughtful to include this little known fact about the 37mm in game. 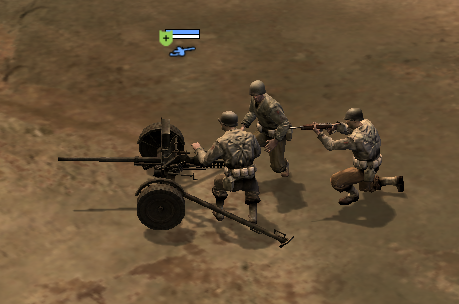 Remember guys, if you want to stay safe, don't hide in a bunker, just hide behind a 37mm anti tank gun, it is more than likely you will survive the skirmish/battle you are in. Thank you for your time. Sometimes my pak survives a whole game because killing these guys is so hard. My first assumption behind this was because the at gun itself is providing 360 degree Green Cover to the two crewman making them nigh unkillable. It might be that. But I also noticed that if you try closing in with say MP40s or MP44s, I sometimes see 80% of the shots targeting the gun itself. It's not been a rare sight for me to see the gun itself destroyed before the crew actually dies. Only the third guy who is not manning the gun is usually working fine and dies instantly to any directed fire from good 6 man squads. So it might just be a targeting malfunction with infantry for properly killing the crew, but then again the 37mm gun shares the same target type as a 57mm at gun, so who knows. markr explained it why. Its bc of the AT gun model, it provides a larger area of green cover than other AT guns..... or something like that. Actually it was kwok who first came with the theory that the problem is the model and it seems to be the case. In every other aspect the gun is set the same way as Axis 37mm gun and the problem is not showing there so it suggests the problem is really with the model. The reason why shots are hitting the gun is that the game engine calculates shot trajectory and the shots can hit objects on their way (same as when your tank fires at another tank and the shot hits a wreck between them - the AT gun acts here as the wreck). It seems that (even when it is not visible) the AT gun acts as a "box" and the two soldiers operating it are inside the box so when you shoot at them from any direction, the shots are hitting the "box". I don't think it is possible to fix this unless the model is fixed and I have no idea how to rework entire models. possible solution....reduce the gun crew from 3 to only 2 soldiers. in addition....you could also make it same as bigger anti tank guns, can not be operated with 1 crew. and there are many other solutions you can squeeze out if you give it just some thought. without touching the model. and how does that solve the problem? Only the two guys that operate the gun are hard to kill because they are in the "cover zone" of the AT. If you reduce the number of soldier to 2, then the one extra (standing behind the gun) will not be there and the two operating the gun will still be "hard to kill". The gun cannot be operated with one crew either - it is only the Axis gun that says "Immobilized" with one crew member. Iirc, the US gun still has the mechanic where last soldiers automatically dies. MarKr wrote: and how does that solve the problem? Only the two guys that operate the gun are hard to kill because they are in the "cover zone" of the AT. If you reduce the number of soldier to 2, then the one extra (standing behind the gun) will not be there and the two operating the gun will still be "hard to kill". this will make it easier because when the crew is only 2 soldiers. if you kill 1 of them. there is no third guy who can replace. it is not always the third guy who dies first. sometimes one of the 2 soldiers operating the gun die first. but with a miracle. but then the third guy comes as replacement. and then you will need a new miracle to kill him once again. or super luck. so if you remove 1 soldier. at least no one will replace them when they die. MarKr wrote: The gun cannot be operated with one crew either - it is only the Axis gun that says "Immobilized" with one crew member. Iirc, the US gun still has the mechanic where last soldiers automatically dies. both have the "immobilized" mechanic. only bigger anti tank guns don't. seha wrote: this will make it easier because when the crew is only 2 soldiers. if you kill 1 of them. there is no third guy who can replace. it is not always the third guy who dies first. sometimes one of the 2 soldiers operating the gun die first. That is not very reliable solution - usually the extra soldier dies first because he has no cover. The problem is that the operators are hard to kill so even if there is no extra soldier killing the first two takes time. seha wrote: both have the "immobilized" mechanic. only bigger anti tank guns don't.